When people get stuck for a gift idea, one of the top things they resort to is a gift card. Gift cards can be great gifts. I’ve been the happy recipient of many of them. I’ve also been known to give them as gifts, too. But sometimes, a gift card is the kind of gift that really isn’t a gift. 1) Is the gift card for a place the recipient will actually visit? Your recipient may oppose shopping at particular stores or eating at particular restaurants. A vegan isn’t going to want a gift card to a steakhouse, even if they do have vegan options on the menu. 2) Is the value of the gift card enough to purchase anything? If you give a $25 gift card to a store, but almost everything worth buying there starts at $35, you’re not really giving a gift. You’re giving a discount. 3) Is there a store near the person or can they use the gift card online? The card will never be used if it’s not someplace they’re able to get to easily. 4)Are you giving a gift card out of obligation? We sometimes get caught up in the idea that we should buy a person a gift for a particular occasion, even if we don’t really know that person well enough to know what to get them. If you truly want to give a gift, and you truly want to give a gift card, by all means, do so. But if you’re only doing it because you feel like you’ll be judged if you don’t, then skip it. Make a plate of cookies and send a card. 5)Will the store be in business a year from now? Sure the economy is improving, but there are still a lot of retailers and restaurants that are struggling. And when those businesses go down, the first thing they do is stop honoring gift cards. Stay away from places that seem risky or you’ll be giving a worthless gift. It can be hard to figure out what to buy for someone who’s hard to buy for. We put a lot of pressure on ourselves to buy the perfect thing. We worry about whether the gifts are enough. And sometimes we come to the conclusion we should just give cash. I don’t know what the right answer is, but I do know that making a rush decision on a purchase of any kind is a bad idea. Take some time to think about the recipient and why you want to give a gift, and a lasting, memorable gift idea will come to you. 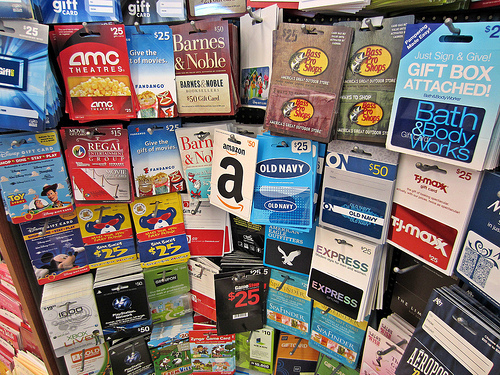 Prepaid Visa cards are great gifts. That’s true! When I wrote the post, I was thinking more of store cards… but the prepaid Visa cards are nice. How true! Good old American greenbacks are better, any day of the week! I won a Macy’s giftcard a year ago, and being the cheapskate that I am, I’m still walking around with it. Nothing in Macys that appeals to the cheapskate in me! Ha! I’ve thought about this, and while I hate to appear an ungrateful gift recipient, sometimes the gift card isn’t really a good gift. If you know the person well, you’ll choose wisely. You send me a Home Depot gift card, it will be spent within 3 months. A brick and mortar book store? Let’s see. Nearly $5 in gas to go round trip, to buy a book I’d probably borrow from the library, or if I wanted to buy it, the online choice is probably cheaper…… you get the idea. Our county sells gift certificates that can be used anywhere in the county. I received one a few years ago and used it towards a new dishwasher. The nice thing is they can be used anywhere and on anything…at a restaurant, gas station, favorite department store, spa, etc. Perfect for anyone who likes to use them on ordinary expenses. Again perfect for anyone who likes to likes to use them on something they wouldn’t ordinarily treat themselves to . I suppose one could give cash, but somehow a gift card or certificate seem more personal. What a great idea! I’ve never heard of gift certificates being sold by a county. May I ask where you live? You could check with your local area chamber of commerce – some of them also offer gift certificates to places that are members of the chamber. Nice insights here. I have also heard that some gift cards decrease in value over time, so we all should ask about this feature before giving one of these cards. I am disabled and have to shop online for most everything and let me tell you a gift card can be a waste of money for someone like me! If I can’t find an item for EXACTLY $25 including shipping, I am up the creek with a balance I’ll never be able to use. I actually wrote to Walmart about it once and they said that some stores will let you do the overage on another card……wrong…I haven’t found one yet unless I call in the order and then I can’t go thru Ebates. Just wanted to throw that in.